3 tablespoons butter, 4 onions sliced ever so thinly; 1 teaspoon mixed dry French provincial herbs (such as: marjoram, thyme, tarragon); 4 cups of preferably beef stock, but chicken will do; ½ cup red wine; 2 egg yolks; couple of drops of natural vinegar, slices of baguette buttered and lightly toasted, grated gruyere cheese. On medium heat, cook the onions in the butter stirring constantly for 10 minutes until softened. Season with salt, add the herbs, cover and let cook on low heat for 40 minutes. Stir the onions every 10-15 minutes. After the onions have cooked down add the stock and wine and cook covered for 30 more minutes. In a bowl, beat the egg yolks by hand with 2 drops of vinegar and mix in a ladle of the hot soup. Stir the yolk and soup mixture back into the soup until heated through, but (as Elizabeth warns in her book) ‘on no account boiling’. She doesn’t explain why, but I think if the soup boils at this point then the eggs would curdle. 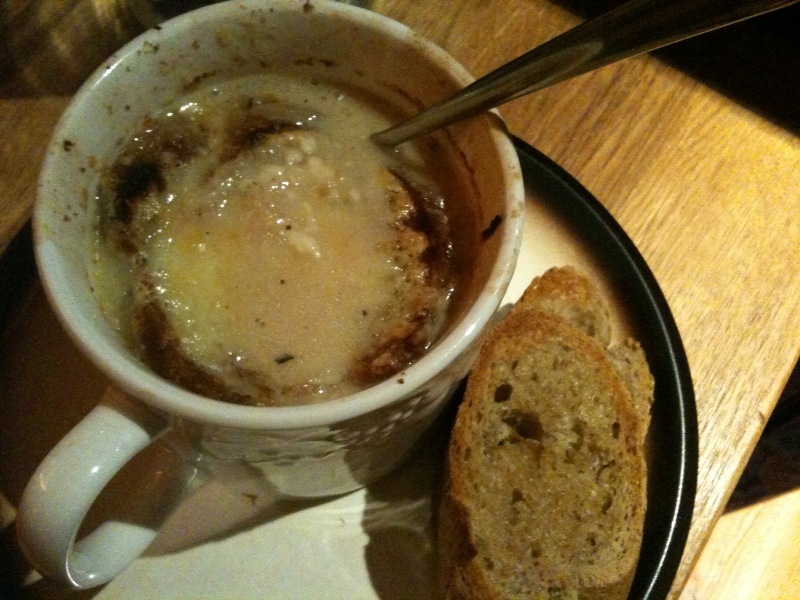 Pour soup into bistro style onion soup bowl, or any oven-proof soup bowl (I used our X-large coffee cups). Cover each soup with slice of the toasted baguettes, enough to cover the surface of the soup. Sprinkle 2-3 heaped tablespoons of gruyere cheese on the floating baguettes. Place the soup bowls under a hot oven grill until cheese melts and bubbles. Be careful not to burn the cheese. Serve and enjoy! This entry was posted in Experiments and tagged elizabeth david, french, onion, provincial, recipe, soup by Besma at Life Demiraged. Bookmark the permalink.